Human rights activists have accused Kenya Urban Roads Authority of violating the agreement that would have seen victim of Kibera evicted in a humane way. The Kenya National Commission on Human Rights has in this regard called for a stop to the on-going demolitions and evictions until the due process is followed. The commission says KURA failed to implement the agreement reached with the National Land Commission (NLC), the affected persons and civil society organisations. KNCHR chair Kagwiria Mbogori further castigated Kura`s communication of the eviction notice saying the message was relayed via twitter. KURA posted a press statement on its twitter platform dated July 20, 2018 purporting to have issued a notice to the residents to vacate over the weekend. The residents maintained they were unaware of the notice, Mbogori said. The position is the same as that taken by rights lobby Amnesty International which accused the roads agency of executing the demolitions illegally. For her part, Mbogori added that evictions must be carried out lawfully, only in exceptional circumstances, and in full accordance with relevant provisions of national law and international human rights and humanitarian law. She added that there is evidence showing that the ongoing demolitions have caused immense harm to the Kibera residents through disruption and destruction of their livelihoods. The Commission said the enumeration and relocation of affected persons must be finalised before structures are pulled down to pave way for the road linking Langata and Ngong Roads. We are also demanding that the government urgently offers adequate humanitarian support and to respond to the immediate needs of the affected people including shelter, food and clothing. Mbogori said the Commission has also learnt that similar evictions and demolitions are imminent in Deep Sea slums and Ngara (Nyayo Market) in Nairobi. The agency further called on KURA and other government agencies to ensure that all future displacements across the country are done in line with the law. The Commission reminds all the concerned agencies and individuals of the consequences of violating the law and the human rights provisions in our Constitution, Mbogori said. Kibera demolitions, which started on Monday at dawn, have so far left hundreds of people homeless, destroyed livelihoods, learning institutions and places of worship. KNCHR further accused Kura of defying court orders in Petition 974 of 2016 prohibiting the government from evicting residents of Kibera without putting in place a Resettlement Action Plan. The High court on April 28 ordered that: In the interests of justice and in order to avoid human suffering, the petitioners be included in the Lang’ata/Kibera Roads committee and be actively involved in the Resettlement Action Plan (RAP) for the Project Affected Persons (PAP). Thousands of Mashimoni residents in Kibera were left homeless when bulldozers demolished their houses. Officers from various security agencies patrolled the slum as the structures were brought down. Many of the residents claimed they were caught by surprise, although the Government had given notice of the demolition and even extended it by a week to allow them to leave. The demolition was to prepare the way for the construction of the Ngong Road-Kibera-Kiungu Karumba-Lang`ata link road. Mary Akoth could be seen rummaging in the debris of what was once her home, looking for any valuables. A plastic plate, a toothbrush, a sufuria and a portrait of her family were all she could find since most of her electronic items had been crushed. The rest of her belongings, including clothes, had been stolen by youth who took advantage of the predicament of those who had been evicted to loot. “Where do I go? Just yesterday I had made arrangements to transport my belongings and my family upcountry as I look for alternative shelter, but now I have nothing left,” lamented Ms Akoth, as she hurled insults at the officers conducting the demolition. The mother of three said she had lived in the area for the past five years. She said she could not afford the cost of moving after the Government’s issued the notice. She added that she could not pay the Sh7,000 rent for houses in the vicinity. Other families who until yesterday called Mashimoni home suffered the same fate as Akoth. According to locals, the demolition that saw the destruction of more than 3,000 houses, started at around 7am. It also saw schools such as Makina Self Help Primary, Egesa Primary, Mashimoni Primary Old Nation Church brought down. The issue of compensation cropped up, with families blaming their failure to vacate the land on lack of resources to do so. Wilson Lundu, who said he had lived in Kibera since 1980, was among the lucky ones who had managed to move their belongings before the demolition began. He claimed that the Government had promised the people financial assistance, but so far the victims had received nothing. “Most people did not heed the call to vacate because they lacked the money to help them start new lives elsewhere. The Government promised to compensate us last week but we have yet to receive even a single coin,” stated Mr Lundu. He also accused the authorities of not communicating clearly. “After meeting last week, there were reports that we had been given until schools closed. That is what brought about the confusion,” added Lundu. However, John Cheboi, the Kenya Urban Roads Authority (Kura) communication officer, insisted that the demolition would go on and that the residents had embraced the exercise. “We talked to the schools to make sure they made arrangements and some of them have hired houses elsewhere where learning will continue. We are impressed because there was no violence and majority of residents moved voluntarily,” he stated. On the issue of compensation, the officer said Kura was working on a report to be handed to Treasury for funds to be released. The report includes the names, phone numbers and identification card numbers of the families affected. Photo on front page: Kibera residents watch as their houses on the road are demolished by the bulldozers in Mashimoni area, Kibra constituency, Nairobi. Source: Elvis Ogina/Standard. 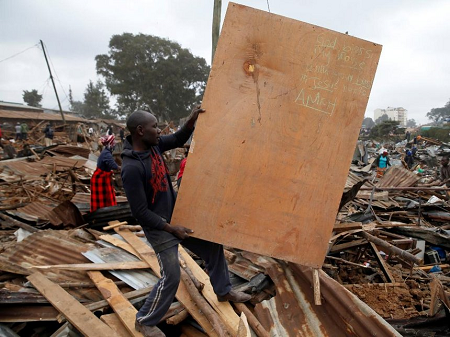 Photo on this page: A man collects a wooden board from the rubble of a house after bulldozers demolished dozens of houses to make way for a new road in the Kibera slum in Nairobi, Kenya, 23 July 2018. Source: Reuters.